Dawn Morrison Brady opens up about her life with Tommy—the good and the bad—and the legacy he left. KOSCIUSKO, MS (October 30, 2013)—TouchPoint Press announced The Tommy “The Duke” Morrison Story, as told by Dawn Morrison Brady, Morrison’s former wife and mother of their “miracle child”, to author Charles H. “Chuck” Hood, is set to release November 4, 2013. Hood describes the book as “a bare-knuckle love story where most of the punches were below the belt and no one was saved by the bell.” Dawn Morrison Brady details events from her first encounter with Morrison to the moment the two-time WBO heavyweight boxing champ kissed the canvas for good. Dawn Morrison Brady took every punch Tommy Morrison had, but in the end, on September 1, 2013, “The Duke” was KO’d by AIDS, leaving Dawn with what she describes as a mix of “crazy good” and “crazy bad” memories. Hood’s biography of Tommy Morrison is based upon personal interviews with Dawn Morrison Brady and her detailed journal entries than spanned over 13 years. 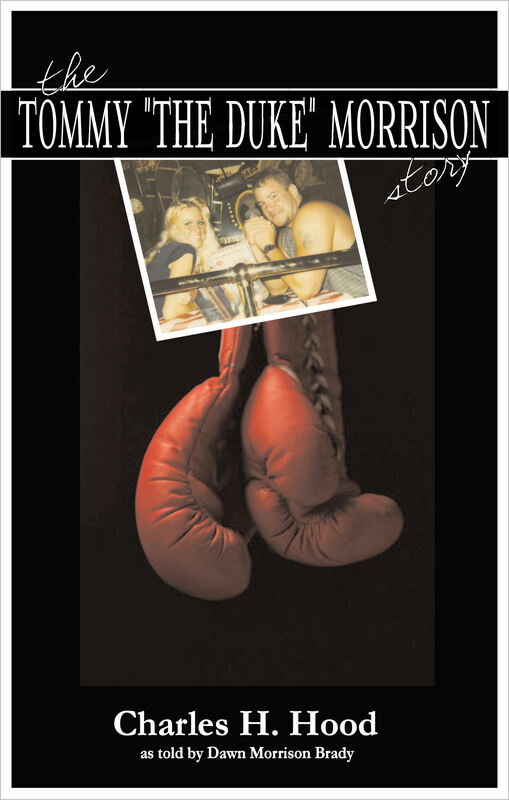 Dawn’s journal reveals early life tales told to her by Tommy’s grandparents, parents, brothers and sister, and it serves as a now permanent record of the life she lived with him for those same hard-fought, abusive years—in and out of the ring. Dawn was described as “drop-dead gorgeous” by those who knew her well and those who had only seen her from a distance, but she was equally tough. The couple’s friends were known to have said many times, “We truly feared for her life.” They knew only too well how abusive Tommy could be, whenever he was under the influence of drugs or alcohol. Yet she stayed with him, from the days of million-dollar paydays to the days when they had no gas or grocery money. The Tommy “The Duke” Morrison Story reveals, in great detail, details about Tommy’s life in and out of the ring, in and out of prison, and in and out of his multiple marriages. Despite the negatives, Dawn Morrison Brady told Charles Hood, “Tommy was also a very religious man, and was most proud when he was addressed as Champ, but nothing meant as much to him as when his four boys called him Dad. The digital edition of The Tommy “The Duke” Morrison Story will be available November 4, 2013 with the print edition to release January 2014. Charles Hood is a veteran of more than forty years in the advertising, marketing and public relations businesses. Hood has worked with major national and international clients including Agrico, Bass Pro Shops, Ben Pearson Archery, the Brinkman Companies, the Brunswick Corporation (Bowling; Billiards; Marine Products – Sea Ray and Bayliner; Brunswick Winter Sports Products; McGregor Golf, Zebco Reels and Rods), Cancer Centers of America, Cities Service Oil Company/CITGO, Daisy Air Rifles, DuPont Sporting Goods (Stren and Remington), Eastman Kodak Company, the National Rifle Association, Pizza Hut, Rubbermaid (Gott Division), and many other nationally and internationally known brands. Hood is a member of the Advisory Board at the University of Tulsa’s School of Journalism and holds a Bachelor’s in Journalism from the University of Missouri with a major in advertising. He is a past recipient of the Tulsa Advertising Federation’s Silver Addy Award, recognizing him as Tulsa’s “Ad Man of the Year.” His creative writing skills have garnered him regional and national ADDY’s and first place awards from the International Film Festival, the New York Film Festival and the Chicago Film Festival. Hood is the author of Wal-Mart’s EGOnomics–Always–The Greed Behind the Smiley Face (www.walmarts-egonomics.com) and Big Rigs, Posh Digs, Fast Cars, Dark Bars (www.charleshhood.com) that chronicles the inside story of the dramatic failure of the Arrow Trucking Company, previously one of America’s leading trucking companies. Hood’s novel, The Pastor’s Prey, based on real life people and events will be released by TouchPoint Press November 1, 2013 with plans to release the true story behind the novel in 2014. Hood currently serves as a marketing and public relations consultant to several public and privately-held companies. He and his wife have four children and seven grandchildren.